sith warrior – Welcome to Spinksville! 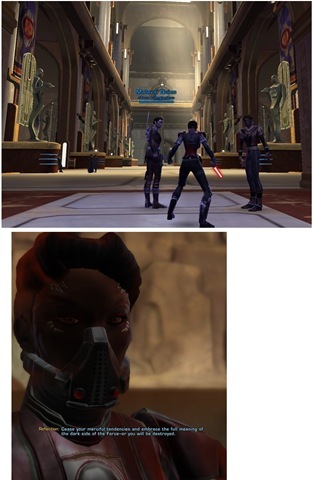 A funny thing happened to me this week while playing Star Wars: the Old Republic. My Sith Warrior chick (partner says accusingly, “She looks evil!” but I think he’s just influenced by being in the same room as me while I’m playing) is in the final stages of her class quest now, and I’ve noticed a couple of difficulty ramps in the single player game as I go. But the funny thing is that this week I realised that I was enjoying the single player difficulty, in fact I’m enjoying it far more than WoW. I may have noted previously that Bioware have done a good job in making the set piece, end of plot arc, boss fights harder than the comparable missions while not being minmaxingly hard (ie. you can beat them if you play carefully even with a randomish build and your choice of companion). But looking back, they have also been teaching you as a player to figure out how to work out a decent rotation (ie. which of your abilities do most damage so you should use them as soon as they come off cooldown, etc), how to use interrupts, using the scenery to help, figuring out how best to handle groups of linked mobs, using your companion to help out, and so on. For example, I struggle to take on two strong mobs of my level … unless I let my companion pull one while I kill the other and then taunt the spare one back. Even the wimpiest of companions, assuming they’re geared at their level, can tank a mob for awhile on their own. Where there is a strong mob with one or more normal ones, the normals usually do more damage and die faster so it’s best to kill them first. Corner pulls can be used to drag ranged mob out of a room. As an MMO dino, I’m familiar with a lot of these tactics, but I get a kick out of how much more manageable the game becomes when I start using them rather than just piling straight into a fight. And what’s more, I’m finding that the difficulty supports the storytelling. Not in every case for sure, but the way the single player class quests balance increasing difficulty with increasing story importance has worked really well to draw me in. And in a way that DAO/ DA2 never quite managed (much as I enjoyed them as story games). I like that as an MMO, players can also choose to level up or bring friends to make the quests easier if they prefer that route. Choices are good. But I think Bioware have hit on some very solid gameplay in the single player quests, still in the MMO mould for sure, but a subtle improvement nonetheless. Now the interesting thing about single player difficulty is that part of the difficulty is because you’re still learning the game and the class. I’m sure if I played it through again on a new Sith Warrior, I’d find the quests far easier. Partly because I know what’s going to happen in the fights, and partly because I’ve learned how the class handles. So I want to record that NOW on my first ever playthrough, without looking up builds, gear, or rotations and learning as I go I found that the difficulty level was fun and appropriate. I like only having to worry about one companion, as opposed to the party based DAO, it keeps things fluid and dynamic while not having too many NPCs to gear up and worry about at the same time. I hope that this is something Bioware can build on in future content. I don’t expect single player endgame to be their main focus, but in SWTOR, they may actually have built one of the more solid gameplay engines of any of their games that I have played. So I found it interesting that Tobold wondered today whether the game will be appealing once the stories have run out — it’s a valid thought, and I enjoy the stories, but I think the gameplay has a lot of merit too. 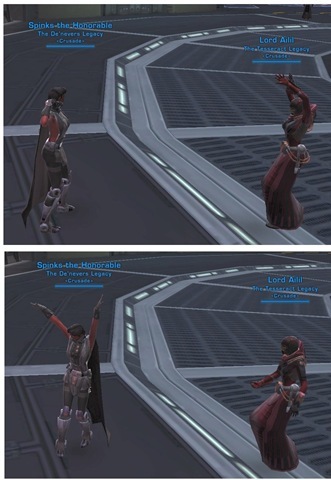 [SWTOR] Quest of the day, companion chat, and when is a ban not a ban? 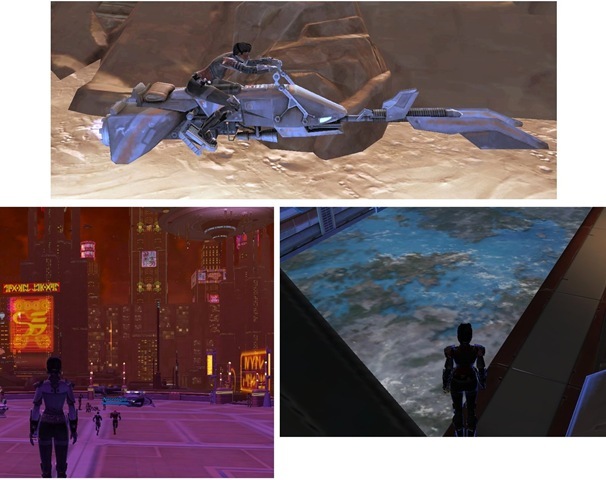 I’ve mentioned before that I love the graphical sides of being in cities or built up areas in SWTOR. 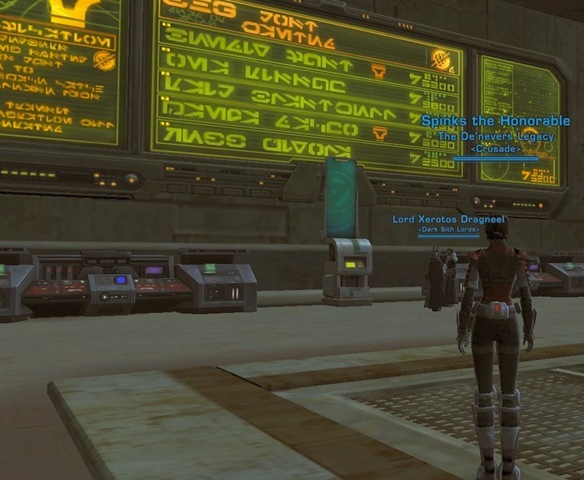 In this screenshot, my Sith Warrior surveys the departures board (I assume) in Taris spaceport. 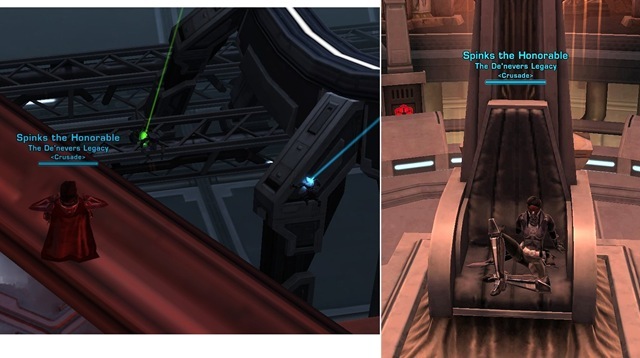 Taris is interesting in many ways, especially to anyone who remembers it from KOTOR when you encounter the planet before [spoiler alert] it is turned into an industrial wreck. This game takes place around 300 years later, and although Taris is mostly a swampy ruined wreck, it’s been interesting enough that both Republic and Empire have forces there and there are some alien settlements also. It’s not an especially pretty planet, but gives the Bioware artists more opportunities to show their chops on wrecked out industrial landscapes. And swamp. What I found enthralling is that my class quest here could be boiled down to “find and kill four named republic generals.” That doesn’t sound too exciting, and mechanically it is exactly what your character is doing. And yet, due to the writing, the quest presentation, music, and pacing, it included some of my most memorable moments in the class story so far. I laughed. Why can’t you ever say anything that romantic when we’re actually on the ship and don’t have 10s left to live?, I thought, although that option wasn’t actually present. I have enjoyed having Quinn around while questing. He does occasionally pitch in to suggest ideas, or comment on military plans that someone else suggested. Annoyingly, he’s always right. But that comment above came from left field, I was expecting him to have a smart suggestion. But now I’m curious as to what other companions might have to say for themselves during quests and whether it’s comparable, or if Quinn is an outlier and the writers just liked him. Because I’m a) really digging the game and b) am on holiday at the moment, I’ve been online much more than I usually would. There is a risk in Bioware-type games that once hooked, you can burn through the quests very quickly because you’re just that keen to find out where the story is going. I remember feeling similarly exhausted in Cataclysm-era WoW, because the quest pacing was fast enough that you could burn through content like a three year old in a sweet shop. And it gave me the quest equivalent of a sugar rush back then too. I am already thinking that I may play another Sith Warrior alt, and take it more slowly next time, writing up each planet or questline as I do it with commentary. Having said that, the pacing in SWTOR is generally fine (this is on a scale where LOTRO is glacial and WoW is superfast). It’s a bit slower than WoW because of travel time, listening to quest mobs (if you don’t spacebar through them), and zoning in and out of your ship, and although some would disagree, I find that it gives you some slow time to appreciate the scenery rather than rushing questquestquest. I have found the difficulty generally good in the game. I’ve been upgrading my gear via quests and gear tokens (which you get for planetary quests), and using biochem to keep myself supplied with healing and buff potions. I am enjoying that I can sometimes die in quests, but that when this happens, I can try again with a bit more thought and get through it. The end of chapter 1 was a particular high point and I died about 4 times in one part before I got the hang of it. Finishing that questline and picking up my legacy name felt like that much more of an achievement. We’ve also had a chance to run some more flashpoints, none of which have really compared to Black Talon in terms of story. Which is not to say that they haven’t been fun. Plus you may meet some old friends in Boarding Party/ The Foundry which was split into two parts so as presumably to be more manageable for players. (I don’t think either is especially long but they work fine as shorter halves.) We’re still dual tanking them, although I’m now taking on more of the single bosses/ tougher mobs. If you read the comments on the RPS story about this, you’ll see how quickly some players get riled up about this. And how people are able to (with a straight face, I presume) argue that innocent players who just wanted to test the limits of what the game allowed them to do are being HURT by this evil EA attitude. But as an experienced MMO player, I tend to assume that ultra competitive players have a propensity to be obsessive cheating gits (as shown by every exploit in WoW ever) who are not satisfied with merely finding interesting loopholes and reporting them but will then go on and exploit them as if their lives depended on it until stopped, and if that ruins the game for other people then that’s seen as an added bonus. So colour me unsurprised when RPS later posted a more nuanced explanation, and were immediately accused by their readers of pro-EA bias. What we get from this is that the readers of RPS tend to be twats. Or maybe it’s just that most gamers are twats (present company excepted, naturally), the jury is still out. Don’t get me wrong, I have no issues with people playing competitively. But if something needs a fix that cannot be done immediately (ie. needs time to decide what the best way is to proceed), I have no issues with temporary bans being handed out while that happens as long as the players were given the chance to stop the offending behaviour first. Also I have no issues with people being banned for gold farming. And one of the good things about playing a sub game is that they usually have active CS teams to deal with this kind of thing, which I believe makes the game better and fairer for everyone else.